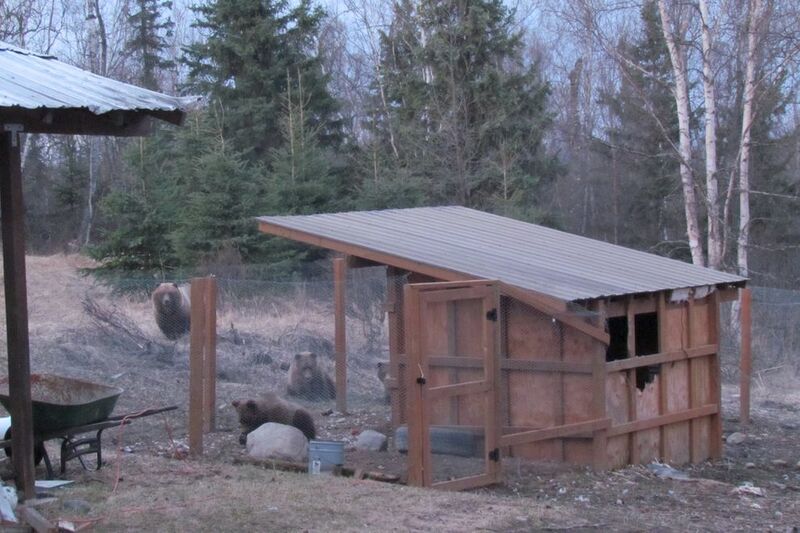 State biologists shot and killed a brown bear Wednesday morning in Chugiak after the sow and its three cubs raided trash cans and attacked 22 chickens and a goat, according to the Alaska Department of Fish and Game. It was the agency's first bear kill of the season in the Municipality of Anchorage, said Ken Marsh, a Fish and Game spokesman. Over the weekend, he said, the department received a significant increase in reports of bear activity within the municipality, both sightings and concerns about bears getting into garbage. "They're clearly up and moving around," Marsh said. 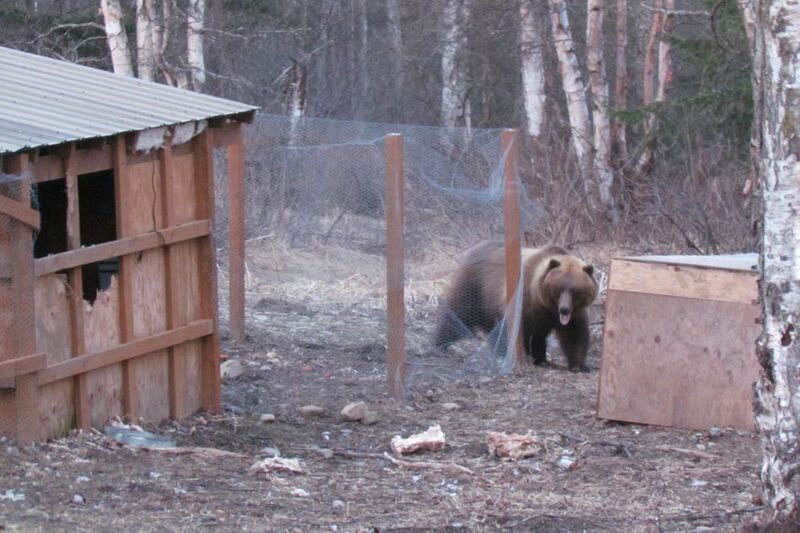 For the past three weeks or so, he said, complaints surfaced in the Chugiak and Eagle River areas about a brown bear sow and three cubs turning over dumpsters and eating trash. The cubs are either yearlings or 2 years old, he said. Based on the bears' behavior and location, wildlife biologists believe they're likely the same bear family caught digging in trash cans in Eagle River in November instead of hibernating, Marsh said. On Tuesday, the four bears showed up at Birchwood Camp, a year-round retreat run by the Alaska Conference of the United Methodist Church near Beach Lake in Chugiak. Camp director Relena Myers lives on the heavily wooded property with her husband and their two children. 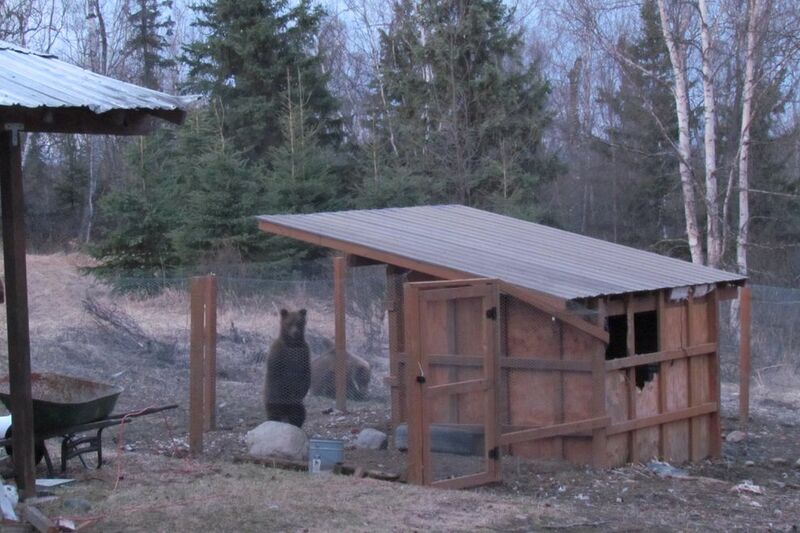 While she and her kids were in Fairbanks, the bears arrived, she said. Her husband told her their dog, Penny, woke him up around 5 a.m. Tuesday. Penny "only barks when we have bears or porcupines," she said. By the time her husband went outside to see what had happened, there was carnage. 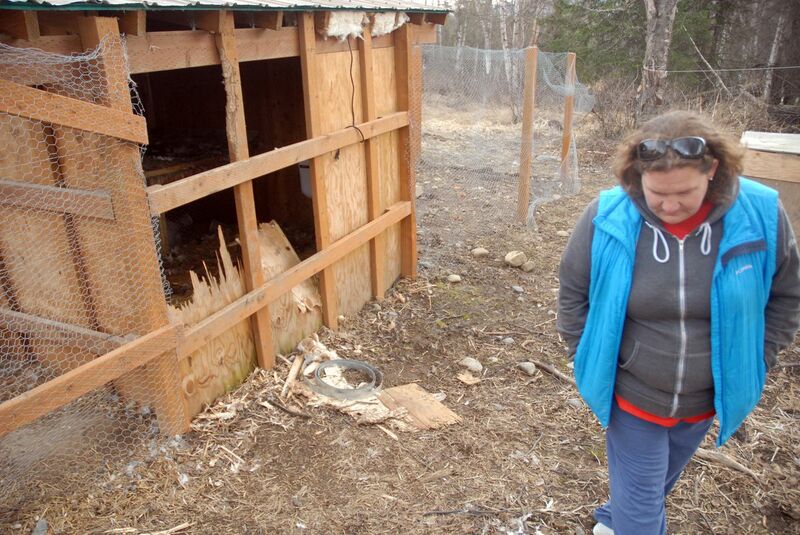 A hole had been ripped into the back of the wooden chicken coop, and feathers were everywhere. "There were dead bodies from here back to those trees," Myers said. Strewn about the property, she said, were 22 dead chickens and an 11-month-old dairy goat named Aster that had become part of the family. "She followed us around like a dog," Myers said. Myers' husband called Fish and Game and put what remained of the family's livestock in a bear-proof dumpster. Myers and her kids came home Tuesday, and later that night, the bears returned too. The family called police, who showed up along with Fish and Game. Myers said wildlife biologists stayed until around 1 a.m. Wednesday, leaving when the bears didn't return. Then around 4:30 a.m., Penny started barking again. "Fish and Game came right away," Myers said. The sow charged Penny, but Myers was able to fend the bear off by shouting from the porch. The charge was one of several over the past two days, she said. "This is the exact type of behavior that concerns us," Marsh said. Marsh said wildlife biologists responded to the camp around 5 a.m. and located the bears. The sow was shot and killed. The cubs fled into the woods, Marsh said. "These guys should be able to make it on their own out in the natural environment," he said. "As long as they stay in their natural environment, we're not going to pursue them." Myers said she and her family plan to keep a close eye on the woods around their log cabin home, which doubles as the camp's office. "We are still watching for the cubs because they know this is where they got food," she said. The Myers family has lived on the property near Beach Lake Park for two years after moving to Alaska from Nebraska. Bears are not an uncommon sight, Myers said. "Usually we use pots and pans to scare 'em off," she said. The family started keeping chickens outside their home last year. The birds produced more than a dozen eggs a day, Myers said. "My kids love eggs," she said. She said the family has an electric fence to go around the chicken coop, but had yet to set it up this spring. On Wednesday, she expressed regret for not being more prepared. "I feel like I should have known better and put up my electric fence faster and earlier," she said. "I guess, thinking about it now, I'm sad that all these animals lost their lives and I'm sad that the bear lost her life too. The whole thing's sad." By Wednesday, Fish and Game had yet to receive a report of anyone in the Municipality of Anchorage killing a bear this year while defending their lives or their property, Marsh said. Fish and Game keeps record of those bear kills, as well as bears killed by police, park rangers and wildlife biologists, like the sow in Chugiak. Last year, that total reached 34 in the Municipality of Anchorage by November — nearly four times the number in 2016 and among the highest totals ever recorded in the municipality. Correction: This story has been updated to remove incorrect references to the Anchorage Bowl.